Liberator Medical Holdings is a fast-growing, profitable distributor of medical supplies, focused on managing chronic conditions. Liberator’s balance sheet is pristine and the company recently announced a dividend and buyback authorization. Many who suffer from chronic conditions, are recovering from surgeries, or are simply feeling the effects of old age require disposable supplies like catheters, ostomy bags, or diabetes treatments. These products can be embarrassing to purchase, or require trips that are difficult for the ill or elderly. Liberator provides these products, as well as post-mastectomy clothing, offering convenient home delivery and works closely with Medicare, Medicaid and private insurance plans. Liberator Medical relies on TV advertising to reach its core market of seniors and the disabled. Does this descripton of Liberator Medical Holdings reminds you of another company with a similar name and business model? Here’s a hint. 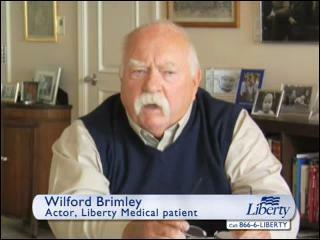 Liberty Medical Supply, famous for its Wilford Brimley diabetes commercials, is Liberator Medical Holdings’ much larger competitor. Both companies were founded by the same man, Mark Libratore. Mr. Libratore founded Liberty Medical Supply in 1990 and sold it to PolyMedica in 1996. Rather than rest on his laurels, Mr. Libratore decided to build a business all over again and founded Liberator Medical Holdings in 1999. The most significant difference is the focus of the two companies. While Liberty specializes in diabetes care, Liberator focuses on urological catheters. Since its founding, Liberator’s revenues and profits have grown at a prodigious rate. Revenues in 2007 were just $2.25 million, but revenues for the twelve months ended March 31, 2013 climbed to $65.76 million. Liberator turned profitable in fiscal 2009 and hasn’t looked back. Liberator’s margins slumped in 2011 and 2012, but are once again on the rise. Fiscal 2011 was affected by a large increase in advertising expense, which has since trailed off as a percentage of revenue. Recent results show the company in transition from ongoing cash consumption to cash generation. So just how did Liberator go from practically zero to over $65 million in revenues in only five years? Part of Liberator’s success comes from increased healthcare spending in the US. While the growth rate has been slowing, spending on chronic conditions such has increased significantly over the past decades. An aging population will likely cause further increases. Liberator has also benefited from industry consolidation. The company cites HME News, a Home Medical Equipment industry publication, which explains that increased Medicare accreditation and bonding requirements introduced in 2009 have driven many small competitors out of the market. But the biggest tailwind behind Liberator’s growth is a change in Medicare reimbursement policy introduced in 2008. Prior to April 2008, Medicare would pay for only four urological catheters per month. In April 2008, the allowable number of catheters was changed to two hundred. The change was made in response to pleas from health groups and physicians who emphasized the safety and infection risks created by requiring patients to use single-use catheters multiple times. Predictably, catheter sales took off, and catheters now make up the majority of Liberator’s revenues. Liberator’s balance sheet is strong. At quarter’s end, the company held $7.04 million in cash against total debt of $2.50 million. The current ratio was 3.38, and liabilities made up 34.62% of total capital. The company’s strong finances allowed it to declare a 3 cent dividend (ex-date today) and a $1 million share buyback authorization. At a share price of $1.40, Liberator trades at 17.64x trailing earnings. Of course, valuations based on trailing twelve month figures can be deceiving for high growth companies. Annualizing the most recent quarter’s results gives a trailing P/E of 12.89. Liberator’s revenue growth from 2009 to 2012 averaged 34.3%. Growth for the most recent quarter vs. a year prior had slowed to 14.1%, but the company’s growth rate still warrants a premium valuation, not a discount to the broad market. Multiple value hedge funds are invested in Liberator. Millenium Partners owns 16.03% and Kinderhook Partners owns 8.55%. CEO Mark Libratore owns 36.07% as of the 2012 annual report. Investors in Liberator will benefit from a growing market for the company’s products and a CEO with a history of success in the medical products market, but risks remain. Liberators’s biggest vulnerability is its exposure to Medicare reimbursement rates. As the government giveth, the government taketh away. The reimbursement rates offered on Liberator’s products could be reduced at any time, which would instantly reduce Liberator’s gross margins. Liberator also experienced some accounting difficulties a while back, ultimately restating several quarterly reports. Liberator’s auditor is Crowe Horwath LLP. Liberator received a clean audit opinion from Crowe Horwath for its 2012 and 2011 financial statements. Mr. Libratore is 62. He has run the company for fourteen years and may do so for many more, but ultimately he will retire and may wish to sell the company he built. I view the endgame for Liberator Medical Holdings as identical to that of Mr. Libratore’s previous venture: a sale to a larger medical distributor, perhaps even to Liberty Medical. I expect that transaction to occur at a very nice premium to today’s share price, with attractive dividends along the way. I own shares in Liberator Medical Holdings. how did they do between ’99 and ’07, if ’07 revenues were $2m? I wish I knew. Unfortunately, the company was private during that time. It does take a substantial amount of time to build up a sales staff and reach a “critical mass,” after which growth can be much more rapid. Also, it is possible that the business was inactive for a period of time after its legal founding date. 1. I understand the barriers for the mom and pop players, but what are the barriers for a bigger player to get in if the industry is getting more attractive? I know Medco (then divested by Express Scripts) bought Polymedica in 2007, so it seems like there is some interest in the market. 2. How affected would LBMH be by falling Medicare reimbursement rates since it is just an intermediary and just receives a fee per transaction? My impression is that right now, Liberator is the dominant force in the market for direct-to-consumer catheter distribution. Like you noted, smaller firms may lack the resources to compete and remain in compliance with the various regulations. However, the size of the entire catheter market remains too small to interest large competitors like Medco. In its annual report, Liberator states it was responsible for 59% of catheters distributed through Medicare. That implies the size of the entire market is no more than $100 million at present. The diabetes market is many times larger, which may be why Medco found Liberty Medical so attractive. Liberator, like Liberty, is primarily a marketing company that succeeds through name recognition and network effects. There’s nothing fundamentally unique about the catheters it distributes. The company achieved its 59% market share through superior service and marketing. Competing with Liberator would require a massive investment in marketing and branding. In the long run, simply acquiring Liberator could be much cheaper. In my opinion, Medicare reimbursement rates are Liberator’s primary risk factor. These rates are entirely beyond Liberator’s control. If there’s any positive aspect, it is that catheters are extremely basic medical implements that are unlikely to become obsolete. I’d be more concerned about some risky, unproven treatment being replaced or having its Medicare coverage cut. Size of market is more than $100 million. Don’t forget Medicaid, private insurance, and cash sides. True. I should have indicated I was only considering the Medicare market, since that is Liberator’s primary revenue source. How do you feel about their accounting for deferred advertising and capitalization of these costs? I know this is qualifies as acceptable under GAAP; nonetheless I feel it is agressive. Makes it hard to discern what is trully profit. The more conservative treatment would be to expense these costs as incurred, but I view the treatment as acceptable. Since Liberator is a marketing company, these costs probably are more like capital investments than they are operating costs. A manufacturer capitalizes the expense of new equipment, Liberator does the same for advertising. Thx. what kind of cost of capital do you feel is appropriate? I’ve modelled the numbers out, adjusting EBITDA/capex to treat the advertising spend like cap ex. Assuming growth trends down to 5% long term rate over next 5 years. Assume ebitda margins are largely flat from here, with capex coming down a bit (adjusted EBITDA flat at 22% over long run and capex including advertising spend at 13% of revenue over long run, leaving operating cashflow at 9% over the long run). Sustainable FCF after tax projected at ~$5mm in 2018. With these assumptions, I can only justify the current stock price with a 10% cost of capital. Do you feel that is appropriate? I was hoping for a higher implied IRR here. Am I missing something that you see? Higher sustained growth? profit margin expansion? What do you guys think of the 60+% runup since this article was posted? I got in at about $1.60 and am thinking of selling and waiting for it to cool off a bit. I think the company is still a good bet for the long run but I’d take a little off the table here. 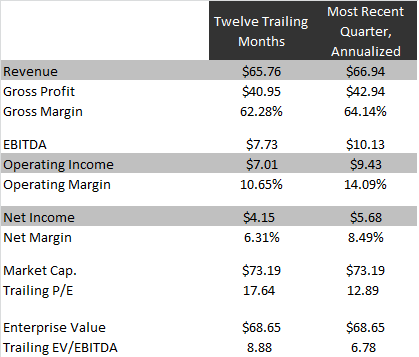 22x trailing earnings is not an extreme ratio for a company with this kind of growth record, but the margin of safety is not nearly as big as it once was. Congrats on the successful investment so far! Thanks, but you deserve all the credit finding LBMH!